To make it as easy as possible to promote National Recycling Week to your constituents, staff and colleagues, we have developed a range of promotional resources for you to use. Planet Ark's new research for National Recycling Week 2018 will explore the impact of the War on Waste and China's waste policies on Australia, the opportunities and positive waste stories emerging and the tools making it easier for you to reboot recycling. The theme for National Recycling Week (12 -18 November 2018) is ‘From Waste War to Recycling Reboot’. It will explore the impact of China’s waste policies on Australia, the journey of your recycling. It will aim to restore confidence in recycling by celebrating Australia’s positive recycling stories as well as our achievements around product stewardship. 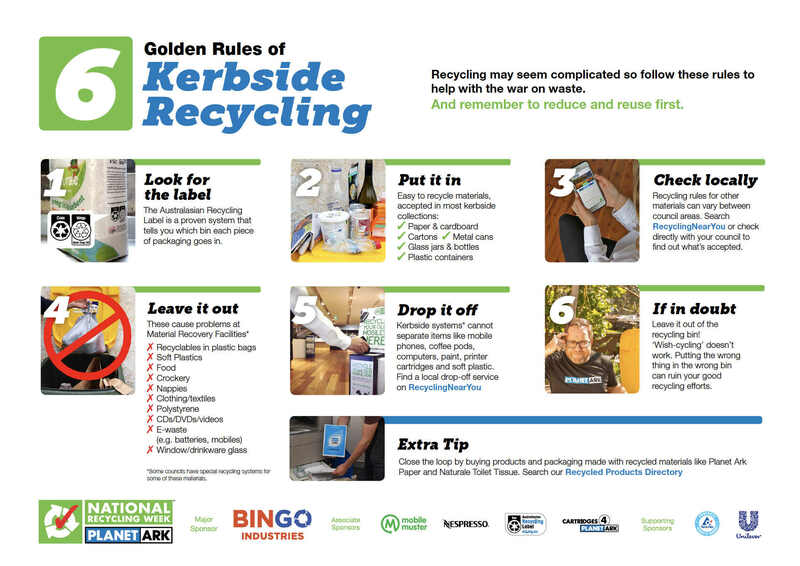 Use our new Golden Rules of Kerbside Recycling individual graphics on social media during National Recycling Week. Tag the Planet Ark facebook page when you tell your fans/followers about your support, hashtag #NationalRecyclingWeek, tag @PlanetArk in your tweets and @planetark in your Instagram posts. Send us any interesting facts or images that we can post about on our Planet Ark facebook page, and like us to receive recycling updates. The below email can be used to help us promote National Recycling Week to your constituents, staff and colleagues. Simply cut and paste the text below and hit send! [Insert Parliamentarian name and title] and Planet Ark are encouraging Australians to help us reboot recycling by taking control of their own recycling journey and discovering the many elements of recycling that lie outside the public eye. Nearly all Australians recycle and think of themselves as conscientious recyclers, but many residents want to know what happens once the wheelie bin is emptied from kerbside. "It's important for [Insert electorate] residents to continue having confidence in recycling and being active recyclers ," says [Insert Parliamentarian name and title]. " By understanding recycling, whether it be kerbside recycling, or through product stewardship schemes, reuse options or buying recycled we can all do our bit to support our Australian recycling industry ." Visit RecyclingWeek.PlanetArk.org or call the National Recycling Hotline on 1300 733 712 to discover the many ways you can get involved in Planet Ark's National Recycling Week events and initiatives, whether at home, school or work. National Recycling Week 2018 is kindly supported by Major Sponsor Bingo Industries, Associate Sponsors MobileMuster, Nespresso, Australasian Recycling Label and Cartridges 4 Planet Ark, and Supporting Sponsors Unilever and Tetra Pak. Planet Ark makes the National Recycling Week logos (including Buy It Back Day) freely available to councils, schools, not-for-profits and community groups to help promote recycling or recycling education. For-profit businesses wishing to use the trade-marked NRW name or logos to promote their business activities or to generate PR for themselves must contact Planet Ark before use to seek permission.